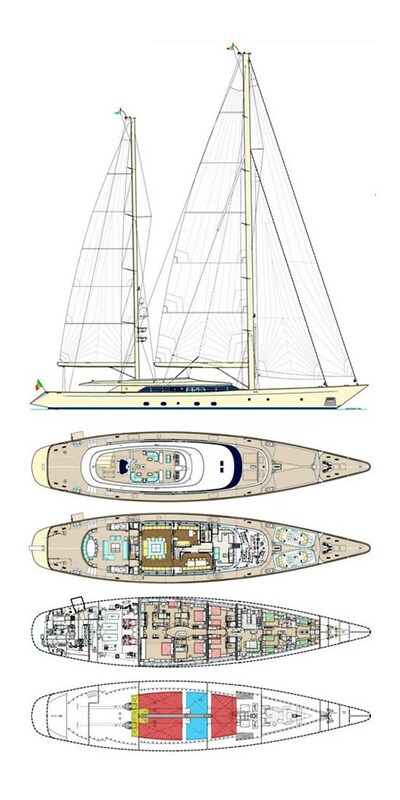 Second Perini Navi for a long established yachtsman, third of the 56m series, S/Y Rosehearty was the first Perini Navi to feature an interior design by the celebrated French designer Christian Liaigre. The innovative layout was years ahead of its time, with open spaces in the guest cabins and a unique use of volume. The current owner has added a passage making cabin on the main deck. S/Y Rosehearty has travelled extensively, up the North West Passage and down to Antarctica, in typical Perini Navi spirit. A fully-shaded aft deck dining and lounge area with a 60 inch television leads into the spacious main saloon and the only Perini Navi SY with a 7th stateroom located on the Main Deck. Interiors are sophisticated and modern with white linen, pale oak, ebony and Hermes leather. Exteriors hardy enough to explore Arctic and Antarctic glaciers in comfort!